In a medium bowl, add the meat, 1 small onion, Add finely chopped garlic, panko, extra-virgin olive oil, the egg, the zest and most of the juice of lemons. Mix to combine. Add the olives, spices, a handful of parsley and a handful of mint. Combine well. Form the mixture into 4 individual rolls and bake on a parchment lined sheet pan until golden brown, about 35 to 40 minutes. Meanwhile, heat 2 tablespoons butter to a medium skillet over medium to medium-high heat, whisk the flour into melted butter, and then add the Worcestershire sauce and chicken stock, the remaining lemon zest and juice, 1/4 cup honey, and salt and pepper, to taste. Slide the meat loaves into the sauce. (If the meat loaves are cold, tent with foil and gently reheat in low simmering sauce.) 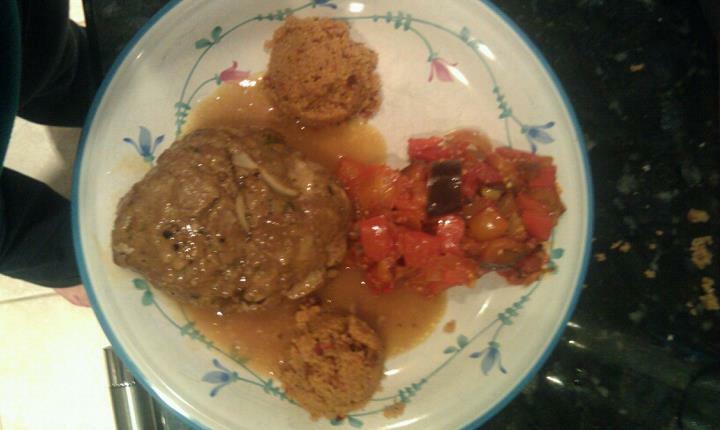 Once the meat loaves are warm, transfer them to a serving plate and raise the heat to high. As soon as the sauce becomes syrupy after 1 to 2 minutes, drizzle it over meat and serve.